Guitar and bass pedals started back in the mid-1940s when they were used exclusively in the studio. They started out unsophisticated and often hard to operate. By the end of the decade, first consumer models hit the market. The first commercial pedal passed the guitar’s signal through a sort of electrolytic fluid to create a vibrato effect. By the end of the following decade, distortion, reverb, tremolo, and vibrato pedals became widely available. Overdrive, wah-wah, phaser, and other pedals came in the subsequent decades and loop stomp boxes made their debut around the turn of the century. The first loopers were simple contraptions that could only record several seconds of material. The common features of today, such as PC connectivity, rhythm machines, expandable memory, and support for microphones and additional instruments, were in the realm of science fiction during the days of the first loopers. Keep reading for my selection of the best looper pedals. Like every other stomp box, a loop pedal should be easy to operate even on a dimly lit stage. That’s where the bare-bones design and straightforward construction of the Boss RC-1 Loop Station truly shine. This is a one-switch, one-pot loop pedal. If you're a guitarist or bassist who wants to keep things simple and clean, this might be the best loop pedal for you. The pedal offers up to twelve minutes of stereo recording and can record an unlimited number of layers. It can remember the recorded loop after it’s been turned off and on again. However, there are no additional memory slots. Two inputs on the right and two outputs on the left make up the standard Boss stomp box connectivity layout. The top of the pedal features the Level (volume) knob on the left, Check indicator in the middle, and Loop display on the right. Red lights are on in the recording mode, while green indicates you’re in the playback mode. Both colors mean you’re in the overdub mode. This pedal runs on 9V batteries and can last up to 4.5 hours on a single battery. Alternatively, you can plug it into a wall outlet with the provided AC adapter. 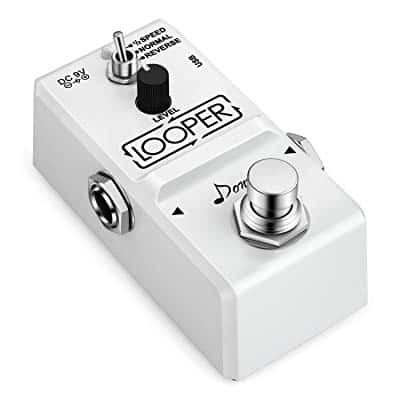 Looper pedals, while not as frequently used as the distortion/overdrive or delay/reverb varieties, can be a real life-saver when you need that extra oomph for the solo or chorus. 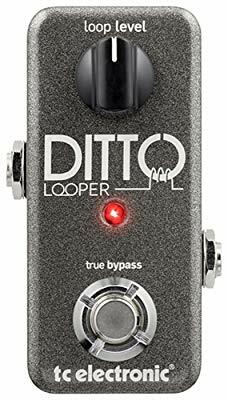 The Ditto Looper by TC Electronic is a basic looper with a single control switch and a volume knob. The Ditto Looper comes in a super-compact housing, half the width and weight of your standard OD/distortion pedal. It has a single ¼-inch input on the right and a ¼-inch output on the left. The AC adapter jack is at the front of the box. The top panel has the bypass/mode/on-off switch, volume knob, and indicator LED light. The pedal gives five minutes of 24-bit stereo recording, which is not that impressive for the price class. It allows you to add and delete an infinite number of layers. However, thanks to it being a stereo pedal, you can send the loop to one amp and play through the other. It is worth noting that the pedal has no additional memory slots and it can’t be connected to a computer. Due to its minute size, this pedal is AC-powered only. Unfortunately, the adapter’s not included with the pedal. What to do when you’ve got a jam-packed pedal board and you really need to add a looper? Go as small as you can. The Rowin LN-332 Nano Looper is one of the smallest out there, made for guitarists and bassists with very limited pedalboard space. It is also among the most affordable pedals that you can connect to the PC. The LN-332 is a super-compact pedal with zinc alloy housing. It has the standard 1/4” output on the left and input on the right, with the AC adapter jack in front. A micro-USB port can be found on the right side. Owing to its size, it doesn’t run on batteries, leaving the AC adapter as the only option. The top panel is equipped with a bypass button, volume (level) knob, and power indicator LED light. The volume knob is pretty small, with a white level indicator against the black plastic surface. The pedal allows for 10 minutes of 24-bit/48KHZ uncompressed stereo recording. The standard unlimited overdubs, undo/redo, and layer delete package is included. To connect the pedal to the PC and transfer loop files back and forth, you’ll need to download and install Rowin’s proprietary app. Many times a simple looper pedal just can’t get the job done, especially when you need pre-recorded loops for your live set. 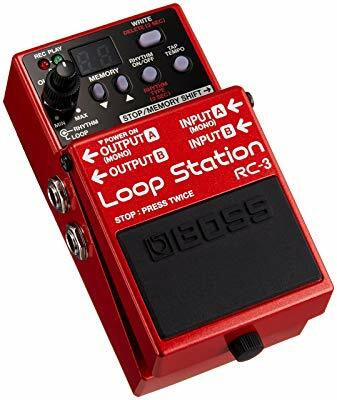 The RC-3 is part of Boss’ Loop Station series. It is located just above the RC-1 and RC-2 but below the RC-30 and RC-300 models. It is there for performing musicians who are looking for a potent loop pedal on a budget. The RC-3 comes in as a standard-sized pedal box, rocking the recognizable Boss styling and build quality. It offers dual inputs (1/4”) on the right side and dual outputs on the left (also ¼”). The 9V DC adapter jack and USB 2.0 port are located at the front. The front panel also has a 3.5mm Aux-In jack. In total, RC-3 gives around 3 hours of recording time in (44.1kHz/16-bit) .WAV format. It can store up to 1.7GB of data. There are 99 empty memory slots onboard which can be scrolled through via two dedicated buttons. You can also play one of ten pre-recorded drum samples in the background while recording. The tempo and time signature are adjustable for each loop. Another neat feature of this great pedal is the stacked knob at the upper-left corner of the top panel. The inner knob adjusts the rhythm preset’s volume, while the outer knob regulates the volume of your loop. Also, this pedal can be set to auto-record when powered up. Aside from live application, loop pedals are among the best tools for practicing riffs and trying out solo ideas. They can be of great help during the songwriting process, as well. 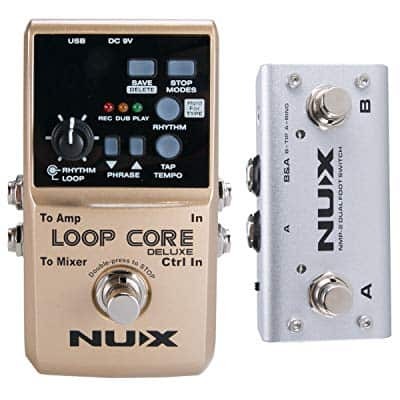 The Loop Core Deluxe loop pedal by NUX is halfway between a basic looper and a looping processor. Pricewise, it belongs to the intermediate class. The Loop Core Deluxe is a standard-sized pedal box with a sturdy metal case, simple user interface, and standard input/output layout. The In and Ctrl In (footswitch) inputs are located on the right side, while the Amp and Mixer outs are on the left. The power jack and Aux-In are in front. This pedal can use 9V batteries and an AC adapter for power. The top panel contains the multi-functional stomp switch used to start and stop recording, initiate overdub mode, and activate playing/repeat mode. The stacked loop volume/drum beat volume knob, preset display, Save/Delete & Stop/Modes buttons, Rec/Dub/Play indicators, two phrase selector switches, and Tap/Tempo indicator complete the top panel. The Loop Core Deluxe can record up to eight hours of music and store 99 presets. The drum machine has 40 presets, 30 in 4/4 and 10 in ¾ signatures. A B-type USB port is used for communication with the PC. NUX also include a handy footswitch with the pedal, allowing players to seamlessly switch back and forth between the recorded loops. Solo musicians who play live and street performers are another group of musicians that can benefit greatly from a quality looper pedal. The Electro-Harmonics 360 Nano Looper is a nano-sized stomp box with super-simple controls and a clean design. With 11 automatically programmable slots, this stripped-down pedal is a great option for all solo performers. The pedal has a ¼” input on the right side and a ¼” output on the left. The AC adapter jack is at the front. The top panel contains the control footswitch, level (volume) knob, and preset selector knob. The “Rec” and “Play” indicators are located at the upper-left corner, while the memory indicator light is at the upper-right. The 360 Nano Looper owes its name to the ability to record loops up to 360 seconds in length. They are stored onboard in 24-bit/44.1KHz .WAV format. 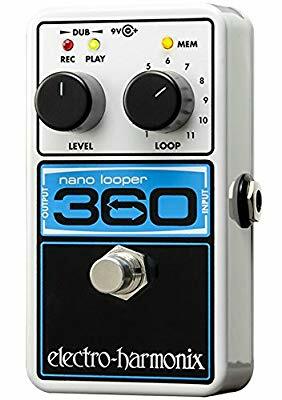 Similar to many other nano pedals, this looper offers unlimited layers per loop. Each loop can be edited with the undo/redo function. Recorded loops are automatically saved to the slot indicated by the right knob. Due to its size, the 360 Nano doesn’t work on batteries, leaving the AC adapter as the only power option. The storage capacity can’t be expanded and the pedal can’t be connected to a laptop or PC. A good looper is an indispensable tool during the writing process, as it allows you to immediately record and test sections of the songs. The Donner Looper is a small loop pedal with big possibilities. It is very affordable, as well. If you’re on the hunt for a simple and small loop pedal, you might want to check this one out. The Donner Looper starts out with a minimalist white nano-sized casing. There’s a ¼” input on the right side, ¼” output on the left, and AC adapter jack at the front. The USB port is located on the right side, close to the input. At the top, this little looper is equipped with a control switch, level (volume) knob, 3-way mode switch, and power indicator LED. The control switch is used to toggle recording, overdub, and playback modes on and off, while the level knob regulates the volume. The 3-way switch at the top plays the recorded loop in reverse (low position), normal (middle position), and at half-speed (up position). The pedal stores loops in 24-bit/44.1kHz format and offers unlimited overdubs. The maximum recording time is 10 minutes per loop. The Donner Looper is only compatible with Windows operating systems. As is the case with nano-class stomp boxes, there is no battery option. Boss has quite a range of floor-based loopers. It starts with the super-simple RC-1 that’s made for inexperienced musicians and those looking to dip their toes in the looper lake. 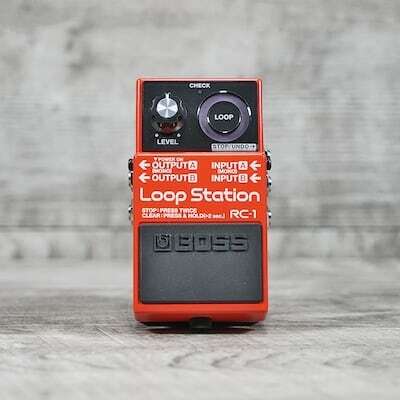 At the other end, the mighty RC-300 tops the Loop Station series. It is a powerful tool aimed at professional performing and recording artists who are looking for the absolute best looping pedal. The RC-300 is actually three loop pedals combined into one big processor. The front panel contains the main input and output jacks, as well as an entire section dedicated to microphones and auxiliary instruments. The loop station also has its own phantom power. The USB, 9V AC power jack, MIDI input and output jacks, and power button are also located on the front panel. The top is equipped with three separate pedals with record/play and stop/clear switches for each. The master volume knob and individual volume sliders are also there. The RC-300 can store more than 3 hours of recordings in 24-bit/44kHz format. 99 memory slots are available. A dedicated effects pedal with 16 onboard effects is located on the right side of the station, allowing you to spice up your tone without the need for external pedals. Back in the day, loopers could only record several seconds of material and had no internal or external storage for additional loops. 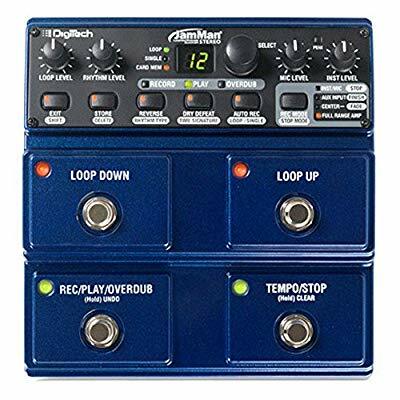 In contrast, the Digitech JamMan Stereo is a four-switch looper with the ability to store over 16 hours of material in 200 memory slots, if an SD card is used. This is by no means a beginner’s looper, considering the featured options and the price tag. The JamMan Stereo is a big and sturdy stomp box equipped with two ¼” inputs, two ¼” outputs, microphone input without phantom power, headphones out, 3.5mm Aux-in, ¼” rhythm machine out jack, dedicated footswitch jack, memory card slot, USB port, and 9V AC adapter jack. At the top, the Loop Down and Loop Up switches are there to browse through the recorded loops, while the Record/Play/Overdub switch works like the main switch of a basic looper. The Tempo/Stop switch controls the rhythm machine samples and doubles as the stop/delete switch in recording mode. The upper panel has separate volume knobs for loops, rhythm machine samples, microphone, the auxiliary instrument. A set of five loop manipulation buttons are also there, allowing you to record, edit, store, and move recorded loops on the fly. 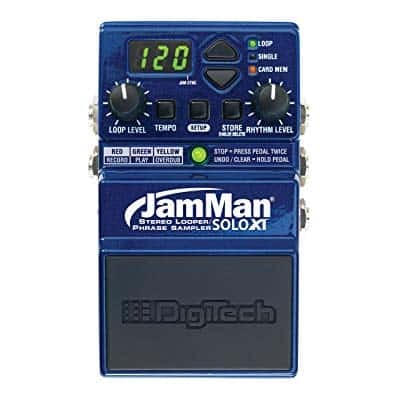 If you need a standard-sized loop pedal that’s packed with features, you might want to take a look at the Digitech JMSXT Jamman Solo XT pedal. 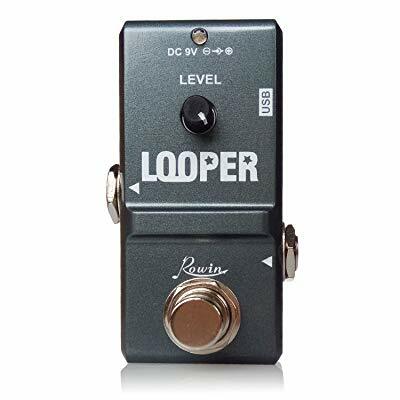 What sets this unique looper apart is the ability to connect and synchronize with another Jamman Solo XT pedal. That way you can create a makeshift looper processor. The JMSXT Jamman Solo XT is a standard-sized stomp box, sporting the classic pedal switch cover instead of a barren step-on switch. On the right side, you’ll find the right and left inputs, Aux input, and an additional footswitch jack. The left side’s equipped with the outputs, USB port, and memory card slot. 32GB is the maximum memory card size. The front panel has the Jam sync In and Out, as well as the AC power adapter jack. 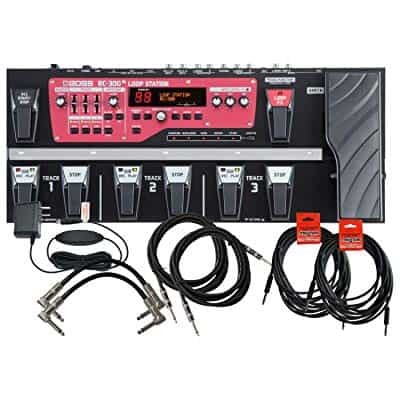 The top features the Loop and Rhythm level knobs, main Record/Play/Overdub indicator light, Tempo, Setup, and Store/Delete buttons, preset browser buttons (up and down), and Loop, Single, and Card Mem indicators. The pedal allows you to store 200 loops onboard and an additional 200 on the memory card. You can also use one of 10 pre-programmed rhythm samples with your loops. You can adjust the tempo and the level of the samples. The onboard memory can take up to 35 minutes of recording material, while the SD card grants you an additional 16 hours. Looper pedals come in many different sizes and shapes, ranging from the mini/nano pedals to full-sized, multi-pedal processors. That being said, standard-sized and double-pedal models are also very popular. The nano-sized models are usually oriented towards beginners and feature only basic recording/overdub/playback functionalities. However, some models might also have onboard or expandable storage, as well as the ability to connect to a PC. Most nano pedals do away with the battery compartment. Standard-sized and double-size pedals represent the intermediate option. They are usually more expensive and advanced than the typical nano class. It is not uncommon to find onboard storage for multiple loops, rhythm machine, SD card support, as well as support for microphones and additional instruments in this class. Commonly, standard-sized models can work on both batteries and AC. Full-sized looper processors are in their own league, often having very advanced features, such as multiple pedals, extensive rhythm samples libraries, MIDI support, as well as phantom power units for passive microphones. Programmable rocker pedals are also among the common features. These processors are mostly aimed at full bands and professional musicians. AC is the most common power option for this class. Loop duration: Modern pedals start at around 5 minutes per loop, while the advanced models can record well over 10 minutes in a single take. Overdub layers: The ability to record an unlimited number of overdubs is standard even in the most affordable pedals. Complexity of controls: When it comes to basic operations, a pedal must be easy to use and operate. A combination of single and double stomp and long press should cover the basic functions. True bypass: A looper pedal shouldn’t affect your tone when in bypass mode. Likewise, it shouldn’t alter it in the recording mode. While not common in the nano class, a rhythm machine is a standard feature in standard-sized pedals. 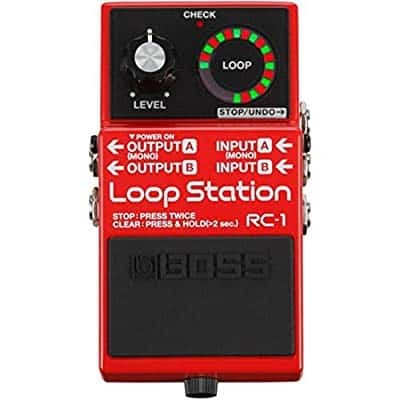 Commonly, the best looper pedals with built-in rhythm machines have pre-recorded drum samples that can be synchronized with the loop, as well as a basic click metronome with adjustable tempo. If a drum machine is present, it’d have its own level (volume) knob. Sometimes, the loop and volume knobs are stacked to save space. Usually, the more affordable models have around ten to fifteen samples, while the advanced models can have dozens. Likewise, some loopers have samples in different time signatures, as well as samples for popular genres and styles. The mini/nano class models are commonly designed to work with only one instrument. 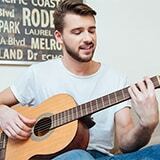 This means that additional instrument support is often omitted in favor of simplicity and low price. Standard-sized pedals, depending on their design, may or may not support microphones and additional instruments. Commonly, if microphones are supported, the pedals are too small to have onboard phantom power units. As for auxiliary players and instruments, 3.5mm jacks are the typical Aux-In options. Looper processors, the biggest and the mightiest, are regularly outfitted with microphone and additional instrument support. Phantom power is among the standard features of a looper processor. Basic looper pedals, regardless of size, can only store one loop in the onboard memory. Commonly, they can save and replay it after they’ve been powered off and back on. The moderately advanced models will allow you to store up to several dozens of loops onboard. As a tradeoff, they might lack SD card slot and USB port. It is not uncommon for an intermediate model to have internal storage and either an SD card slot or a USB port. On the other hand, advanced loopers feature onboard memories, USB ports, and SD card slots. They allow you to store and move loops within and between storages. Also, you’ll be able to save them to and download from a PC. It is worth noting that many pedal brands have their own dedicated apps for communication with the pedals. Almost all of the pedals store recorded loops as PC-readable files, with .WAV being the most common format. Though they aren’t featured on any list of essential and must-have studio and stage items, looper pedals play an important role in both arenas. They can help live musicians beef up their sound in certain parts of the songs, as well as give them the freedom to improvise and create music on the spot. In the studio, they can help musicians who want to practice certain parts of the songs or are struggling with timing in general. Also, they can be of great assistance to composers, allowing them to quickly record song mockups and test out multiple ideas.